The first step to being a winner is believing that you've already won! Look at any winner and you find a common denominator: they prepare to win and they expect to win. Although winning is usually associated with athletic competition of all sorts, the world is full of winners in many other fields. This program will instill a competitive spirit in you which will make you more prone to insist upon being a winner in all that you do. Used by both men and women to increase your mental potential, concentration and total success in your personal life, business world and competitive sports. 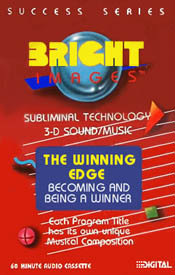 Get the winning edge today of!